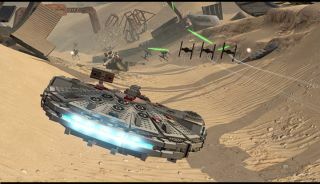 "Lego Star Wars: The Force Awakens" will be released June 28 for PlayStation 4, PlayStation 3, PlayStation Vita, Xbox One, Xbox 360, Wii U, Nintendo 3DS and Steam (Windows PC). May the Force be with you! A new trailer has just been released from "Lego Star Stars: The Force Awakens," which will echo many key sequences of the hit film from last year. Players can take part in airborne TIE fighter battles, check out famous "Star Wars" locations, use the Force to move objects around and assemble epic Lego structures to solve puzzles in multiple ways, as spotlighted in a new game-play trailer. "The enhanced Multi-Builds system allows players to choose from multiple building options to solve a puzzle and advance the game in different ways," Lego representatives said in a statement. "For the first time, the same pile of Lego bricks can be used in multiple ways, with the player building and re-building different objects for different purposes." The storyline of "The Force Awakens" is well-represented in the game, along with some new jokes highlighted in the trailer. One shows Kylo Ren trying to deploy his lightsaber and struggling with it until somebody else sniggers. Ren uses the Force to blow that person away from him, into the sky. The game also reveals some backstory to the movie, such as how Han and Chewbacca captured the rathars (octopuslike creatures seen on the pair's onscreen ship). "Players can relive the epic action from the blockbuster film in a way that only Lego can offer, featuring all of the story lines from 'Star Wars: The Force Awakens,' retold through the clever and witty Lego lens," Lego representatives said. "The game will also feature exclusive playable content that takes fans and newcomers on adventures set in the time leading up to 'Star Wars: The Force Awakens,' providing additional insight about the new movie and its characters." The game will be released June 28 for PlayStation 4, PlayStation 3, PlayStation Vita, Xbox One, Xbox 360, Wii U, Nintendo 3DS and Steam (Windows PC).